I am so excited to post this because I have a next Bullet Journal Notebook!!! I am done with my A5 Dotted Notebook from Muji and transferred most of the entries I really like to my brand new Bullet Journal. As part of my BuJu posts today I will be sharing how I setup my Bullet Journal for May. I will also include the why's, how to's and tips for each entries. 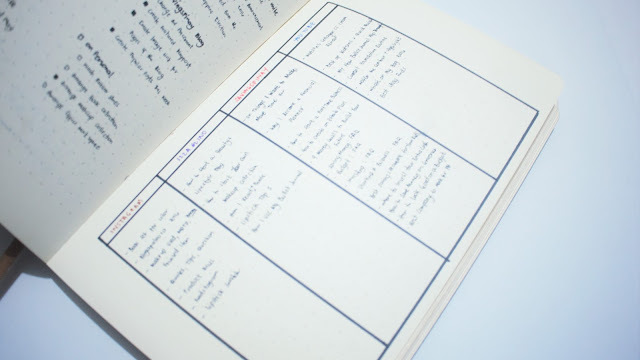 Before I started bullet journal in my current notebook I did a serious planning on what I want my next Bullet Journal to look like. If you follow me on Instagram you'll see my photo about the pages I want to keep, to add and to try. My goal for my next bullet journal is to better. I want to show it off to people through Instagram and Blog. 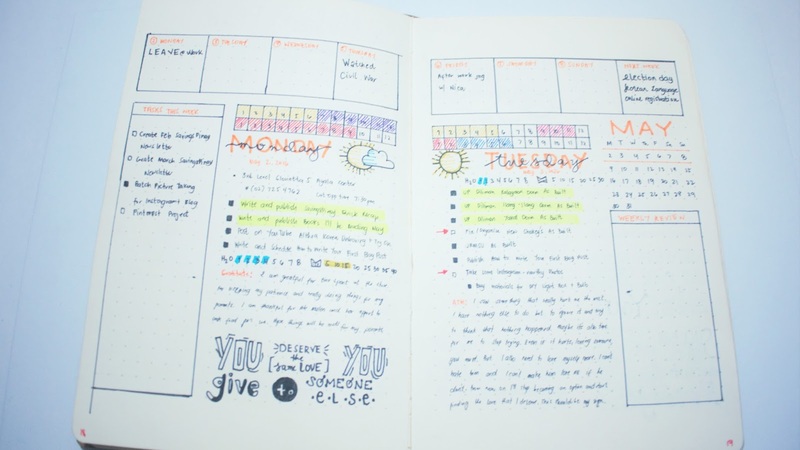 I want my next bullet journal to reflect me and something that I can be proud of. To be honest I am spending a lot of time prettifying my journal just because I love it so much. With that being said and done below is my Bullet Journal for May. 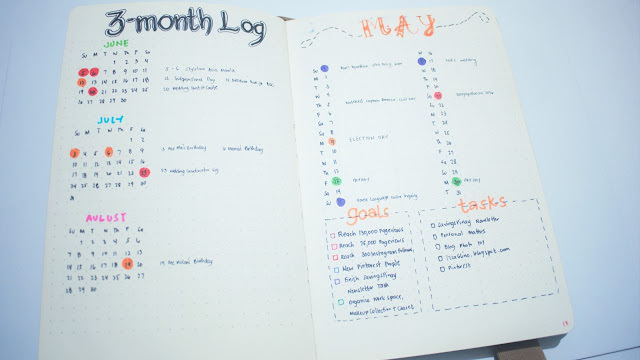 I decided to create a three-month future log before my monthly calendar so I can easily record events, appointments and other special dates that may fall in the future. Since the current month is May my 3-Month Future Log starts with June to August. As you can see I have few dates already filled up. I love this set up so much because I can plan in advance. My current notebook is a little smaller in width compared to my previous Bullet Journal so I had a hard time doing the Monthly Calendar. Because the whole 31 days won't fit in one page I decided to do it half way with my goals and tasks at the bottom. I kinda like this set up because I don't really use the calendar that much only for selected whole day events. As you can see I have color codes when it comes to my Bullet Journal and I had a preview about the codes I use in this post Bullet Journal Index Page and Keys. Again at the bottom of my May calendar I wrote my goals and tasks for the month. I introduced each goal with a colored open box but this doesn't have any color code I just wanted it to be colorful. My tasks on the hand are my Projects for May which I will explained on the later post. I ditched the 3 Focused Habits last month because I have a new entry to track my routines and habits. Now, I saw this layout from another Bullet Journalist and fell in with love it. It is sometimes hard to distinguish between a project and task and I mostly interchange the two. So this page will include my 6 Main Projects for May and corresponding Next Actions to make it happen. 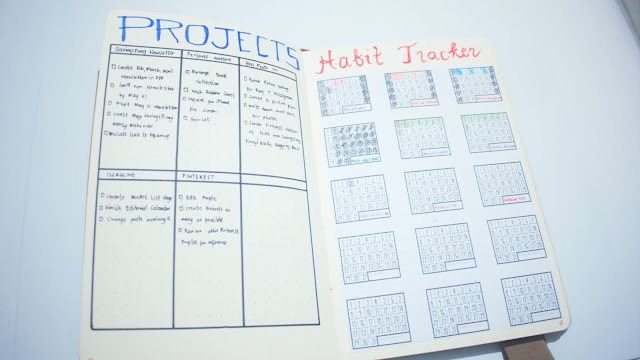 I bought this Tracker from Decade Thirty and love it because I have a lot of room to include the habits I want to succeed for the month of May. This is also very cheap and used the remaining money in my Paypal account to buy on her Etsy shop. The good thing is I already have this copy and I can use it in any way I want whether as a Bible Reading Tracker ect. It's also very convenient for me because all I have to do is start shading. I did a very simple calendar for my May Editorial Calendar because the past became a mess. 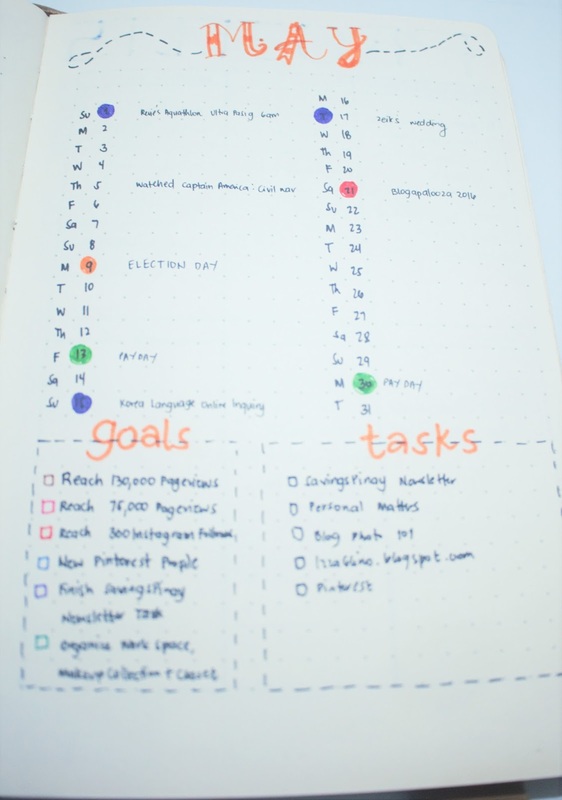 This time I decided to include everything in the calendar and use different colored pen to differentiate one from the other. As I plan I use pencil and once the post is published I change it to colored pen. My current Bullet Journal is a reflection of past mistakes. It has always been a trial and error for me. There seems to be no layout that works and that makes me happy until today. 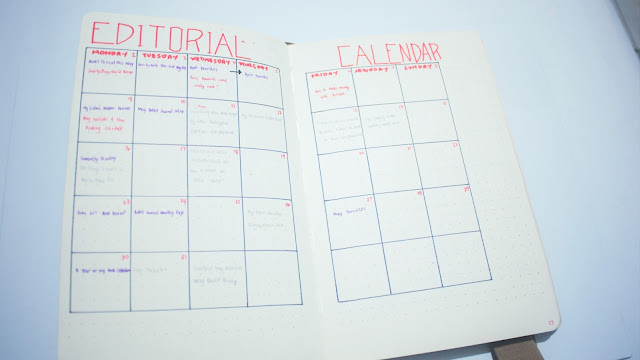 As you can see My Weekly Page is composed of three main sections. The Appointment Boxes that are divided for each day of the week with a "New Week" space. Here I write important events I previously highlighted on my Monthly Calendar. 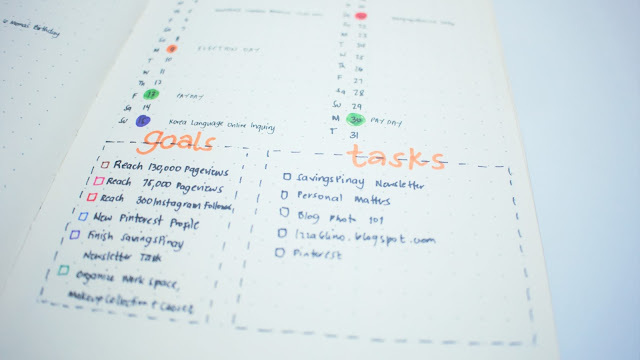 Tasks This Week refers to the Projects and/or Next Actions I will be working on the Week. I am very selective with this so I won't disappoint myself if ever the task is not done. My Weekly Review is a space where I ponder about what happened in the week. My hits and misses and how I will improve for the next week. My Daily Pages are very simple. I introduce each day with a Time Tracker, Date and Weather Icon. 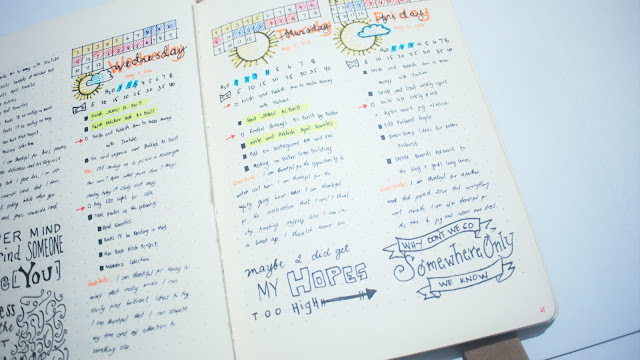 Love these header ideas because they make my Bullet Journal extra pretty. Next are two things I track on a daily basis which is my water intake (H2o) and the number of pages I read in a day. My goal is to read at least 40 pages in a day. After that comes My Daily To Do Lists. Highlighted items are the most important tasks of the day. ATM stands for At The Moment which is a diary type entry if ever I feel something at the moment that I just have to release and write about. I also do my Gratitude Log on a daily basis instead of a the monthly one as seen in my previous Bullet Journal Set Up. If there's empty space I do some lettering of quotes and lyrics that struck me the most. 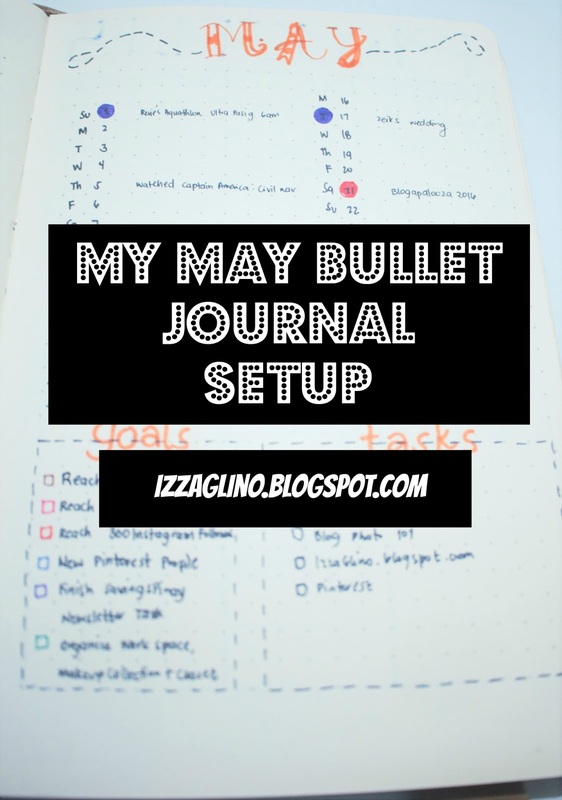 Are you into Bullet Journaling too?